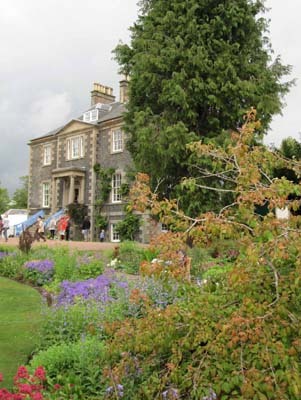 A fantastic literary festival in the beautiful Scottish Borders. I had the pleasure of spending last weekend in the rainy, but gorgeous surroundings of the Borders Book Festival. 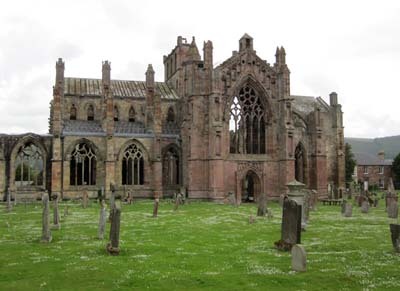 As you can see from the photo, the festival is held in lovely Harmony Gardens, overlooked by twelfth-century Melrose Abbey. The Abbey is a stunning Gothic structure. It’s extremely atmospheric, especially when the weather is overcast. The cemetery adds to the moodiness, with its crooked, weathered monuments. In contrast, Harmony Gardens are full of bright flowers and small sculptures sited in various nooks and crannies. We were treated to a great lunch and refreshments in Harmony House, which served as a ‘green room’ for authors. Being in this historic house gave us a chance to gather our thoughts before an event, soak up the atmosphere, chat with other guests and decompress after our talks. One of the nicest aspects about book festivals is socialising with readers and with other writers. 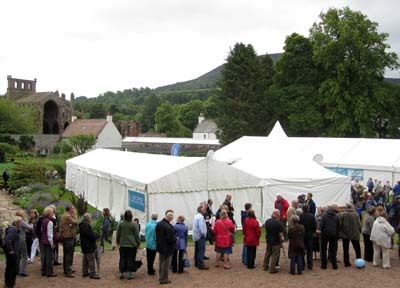 The Borders Book Festival was particularly sociable! I was really thrilled to meet David Mitchell, whose Cloud Atlas is one of my favourite novels, as well as John Byrne, and to catch up with one of the festival’s ambassadors, Vivian French. Here I am in my venue, decorated with bunting, getting set up for drawing with the audience. I am forever dragging around paper, art supplies and promotional materials and have a pretty good toolkit assembled now. We can draw pretty much anywhere! This event had a nice turnout and the children were fantastically imaginative. One of the best things about doing young people’s events is the buzz that gets going when they are excited by ideas. Every child left with at least one great drawing and I got to read to them from The Blackhope Enigma. All in all, it was a very successful day and I really enjoyed seeing this lovely town for the first time. 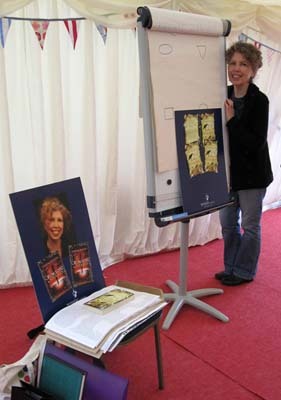 Big thanks to the organisers and patrons of the Borders Book Festival!